If you’ve been following the latest series on Brian’s Travel Spot, you’ll know that I spent the last two weeks of April in Thailand, departing on the Sunday of the London Coffee Festival. The first instalment of this Travel Spot covered my flight over with British Airways. I spent a week in Bangkok, before catching the sleeper to Chiang Mai, where I spent another week exploring its awesome speciality coffee scene. I returned on the sleeper to spend three days in Bangkok, with the two train trips forming the second and third instalments (written and published while I was out in Thailand). Meanwhile, today’s Travel Spot, the fourth and final instalment in the series, covers my return flight on Tuesday 1st May. You can see how I got on after the gallery, a few (coffee-related) highlights from my three days in Bangkok. Before we start, a few words about my back. I’ve had a bad back for about 20 years, maybe longer. Long enough that I can’t remember exactly when it was that I hurt it, although I do vividly remember the incident itself. The story is fairly long and involved, but the short version is that my back is generally fine, partly because I see my chiropractor on a regular basis, which keeps my back from getting out of hand. Every now and then, however, I tweak it and, if the stretching exercises don’t fix it, I pop along to see my chiropractor who gives it a quick manipulation and then everything’s fine again. This is basically what happened to my back in the run-up to this year’s London Coffee Festival, except that I couldn’t see my chiropractor because I was at the festival, and then, the next day, I flew to Bangkok. The issue with my back has always been one of lower back stiffness, leading to referred pain in my left leg. It’s annoying rather than anything else, but it’s never really stopped me doing anything. Until now, that is. During my first week in Bangkok, I started getting pain when I was sitting down, which, given that I was in a four-day long meeting, wasn’t ideal. This was a new one for me, but my back was still (mainly) okay when I took the sleeper to Chiang Mai. It was slowly getting worse, but for the first few days in Chiang Mai, it was manageable. Then I took a long tuk-tuk ride and from that evening onwards, sitting for more than a few minutes was agonisingly painful. Standing and walking was fine, lying down was bliss, but sitting was out. Whether it was causation or just correlation, I don’t know, but I suspect sitting in the cramped tuk-tuk as it rattled and bumped along pushed my back over the edge. It made my last few days in Chiang Mai interesting, to say the least. I built an impromptu standing computer desk in my hotel, and eating at restaurants was challenging, particularly as I had to get up every few minutes and wander around. I mostly drank my coffee at the many coffee shops I visited standing up at the counter. However, it still wasn’t an enormous problem. I could get around, I was sleeping fine, it was just awkward. I returned to Bangkok on the sleeper (any other mode of transport would have involved too much sitting down), built another standing computer desk in my hotel and generally got on with things as best I could. Unfortunately, my back was definitely getting worse. I saw a chiropractor in Bangkok, who did all the things I’d expect a good chiropractor to do, but sadly things were well beyond the point where a simple manipulation was going to fix it. It definitely did my back some good, but sitting was still an issue and, come Tuesday morning, I was dreading the flight back. You can see how I got on after the gallery. I’d chosen my hotel fairly well. Since work wasn’t paying for this bit of the trip, I was in an Ibis, in the Sathorn district, picked largely for its proximity to number of good coffee shops such as Lan Din Coffee, and also because it was close to a couple of stops on the Metro (MTR) line that terminated at Bangkok’s Hua Lamphong Railway Station. This meant that it was easy to get to when I returned from Chiang Mai on the sleeper, plus, if I carried on along the line another five stops, it connected up with the City Line out to the airport at Makkasan station. My flight was due to leave at 11:30 and scheduled to arrive at 18:30 London time, or 00:30 Bangkok time, a whole 13 hours in the air! I left the hotel at 08:20, deciding to walk to the Metro rather than inflict five minutes of sitting on the cramped hotel shuttle bus (which went to the Metro station) on my poor back. Ironically, although sitting down was a real issue, walking around carrying a large, heavy pack really wasn’t a problem. Other than it was 34⁰C and incredibly humid, that is. I paced myself, stopping for one last speciality coffee at Size S, a lovely bakery and coffee shop at the end of the road and roughly half way between my hotel and the metro station. I didn’t linger and the journey on the MTR was remarkably smooth. The interchange stop, by the way, is called Phetchaburi, from where you change to Makkasan, the station on the City Line, the two being joined by a long, covered walkway from the exit of the metro station up to the elevated platform of the City Line. The trains run every 15 minutes and I was lucky, only having to wait a few minutes for the train, which got me to the airport at 09:35. One thing I noticed about the gates to all the public transport lines in Bangkok: they don’t wait for you. They open when you present your ticket, then close again a pre-set time later. When I was wandering around unencumbered, this was fine, but whenever I was slowed down by my large rucksack, the gates would close with me in the middle of them. Every time. Ouch. The other minor annoyance is that the different lines have different ticketing systems, with the Metro’s being the most confusing. All the others have some form of paper ticket which you retain, putting it in a slot at the barriers when you enter and leave the stations. The Metro (which is cash only, by the way) dispenses a round token, which you present, contactless-style, to the ticket reader when you enter the station, but when you leave, you drop the token in a slot. I guess this is so that the machine can keep it for future re-use, which is a good thing, but rather confusing. Despite these annoyances, the public transport was, once again, cheap and efficient. Including my stop for coffee and walk to the Metro, I’d made it from the hotel to the airport in 1¼ hours, spending a total of 57 Baht (less than £1, with 23 Baht going on the Metro and 35 Baht on the train). It was roughly what I paid for my coffee at Size S.
You can see what I made of the airport after the gallery. I’d had a really good experience arriving at Bangkok’s Suvarnabhumi Airport. Departing, however, was slightly more problematic, but not seriously so. There was no queue at bag drop (although I was flying business class, there were no queues at the economy bag drops either: put smug face on hold). By 09:50, I was checked in and by 10:05 I was through security and immigration, although this time I’d used a priority lane reserved for business/first class passengers, avoiding otherwise large queues (smug face reinstated). With my flight not due to leave until 11:30, I had around an hour to kill before boarding, so I decided to check out the business lounge, which turned out to be my mistake. Suvarnabhumi is a big airport and there are lots of lounges, with British Airways sharing with Cathay Pacific. The problem is my flight was departing from Gate D2 and the Cathay Pacific lounge is over in the G Gate area, which, it turned out, is a leisurely 15 minute walk. 15 minutes there, 15 minutes back, which leaves me 30 minutes in the lounge. Except I couldn’t find the damn thing. In my defence, it is really poorly signed and you really need to know where it is. I spent a good 15 minutes exploring the G Gate area before I found it. The airport has an interesting three-level structure, with the main departure area on the top level. This has the shops and restaurants and connects all the gate areas. The gate areas themselves are on the middle level, with each area having its own separate stairs down from the top level. Finally, the gates themselves are on the lower level, accessed by steps down from the middle (gate area) level. What’s not clear is that while you are expected to move around on the upper level, the middle level also connects the gate areas and, because there are no shops and relatively few people, it’s much easier to move around. It’s also where many of the lounges are. My mistake was, when I went down to the G Gate Area, was to head off towards the gates themselves. There were a couple of lounges down there, but no the Cathay Pacific lounge. To get to this, you need to double back on yourself as you soon as you get to the gate area, since it’s directly under the top level. By the time I found the lounge, I didn’t have very long left, which was a shame since it was a pretty nice lounge. There’s a food area off to left, complete with a noodle bar that I would have liked to try, plus a lounge and bar area to right. However, I stayed in middle where there were snacks and soft drinks, plus a little window bar where I could stand to use my laptop and watch the planes taxiing around and taking off/landing in the distance. Having discovered that the middle level interconnected with all the gate areas, I went this way and found that it’s only a 10 minute walk if you put your mind to it. Despite the usual warnings about the flight boarding at 10:50, I got to the gate at 11:00 and no one was boarding. Although I had to queue to get into the gate itself, boarded started at 11:05 (while I was in the queue) and I was able to walk straight onto the plane. You can see what I made of the plane after the gallery. Although this was the same configuration of 777-200 as the one I flew over on, this time I was sitting in the second (and smaller) Club World section, between the main galley in front and World Traveller Plus (premium economy to you and me) to the rear. This small section consists of just two rows of eight seats each, arranged in the usual pairs of seats, one facing forwards, the other facing back. I’d gone for 11K, which was the last row, on the left, the rear-facing one of the pair by the window. For Club World, this seat or its equivalent on the other side is rapidly becoming my favourite (unless I can get upstairs in the 747s). As the last seat, facing rear, it faces a bulkhead, which means that while there’s another seat between it and the aisle, when you want to get in/out, you simply squeeze past the rear of that seat, rather than climbing over the person next to you which is the case for every other window seat. Other than being in the smaller section at the rear, the seat was British Airway’s standard long-haul Club World seat, which I described at length on the flight over. The only difference on the flight back is that I’d remembered to put my US adaptor in my hand luggage, so I could plug my laptop in this time. Boarding was complete at 11:25, and we pushed back at 11:35, just five minutes late, which was quite impressive given how full the flight was. There certainly weren’t many empty seats in Club World. Ironically, the start of boarding had been delayed in the first place because some of the crew had experienced difficulties getting through immigration and we couldn’t start until they arrived! You can see what I made of the flight, and how I got on with my bad back, after the gallery. While we were taxiing, which took the usual 15 minutes, the cabin crew came through and sprayed the cabin with insecticide, the first time I’ve had that happen. Ironically, when I got home, I discovered that I’d brought a bug with me, which fell out (alive) from my clothes when I undressed that night, so it wasn’t that effective! We took off at 11:50 and the seatbelt signs went off at 12:02. Normally, I’d round that down to 12:00 when reporting these things, but on this particularly flight, every minute was important. With the seatbelt signs off, I could get up and walk around after 27 minutes of sitting down which had been become increasingly painful. I’d taken painkillers before I boarded (paracetamol) and, in fairness, the chair was wide and comfortable, but even so, I had to constantly squirm around in my seat to change position in order to make it tolerable. Ironically, the real problem, when sitting down, was burning nerve pain in the back of my left thigh, the result of pressure on my sciatic nerve due to my bad back. Despite all these counter-measures, the pain in my thigh was getting in tolerable and I’m not sure I could have lasted much longer. I dread to think how bad it would have been if I had been flying in a narrow, less comfortable economy seat. As it was, as soon as the seatbelt signs were off, I was up and about. One of the great things about my recent bad back is that although sitting down has been agony, as soon as I stand up, the pain subsides, although it comes back as soon as I sit down again. In this case, after a few minutes of walking around, the pain had fallen to discomfort levels, which I could deal with. However, there was still the question of what to do for the remaining 12¾ hours. Short of spending the entire flight lying down (which I had considered), I needed options. Plus there was the small matter of what happened when I got to Heathrow since I wasn’t going straight home on this trip. Instead, I was taking the short flight up to Manchester to see my Dad, which would require probably 50 minutes or more sat in a short-haul business class seat, which I really, really wasn’t looking forward to. So, I went to talk to the wonderful cabin crew. You can see what they came up with after the gallery. I explained my predicament to one of the cabin crew, who put me in touch with Joe, the crew chief, who was very helpful. We discussed the option (at my suggestion) of taking my meals standing up in the galley, which would have caused all sorts of disruption. Instead, he came up with an idea which I rapidly warmed to: powerful painkillers! It turns out that British Airways cabin crew have access to a range of medical supplies which they are able prescribe. This isn’t a trivial process, since it involves making a call from the plane to the 24/7 medical centre in Phoenix. The symptoms are relayed to a doctor there who makes the yes/no decision. Joe and I filled out a questionnaire about my symptoms and I left it with Joe, who came back about half an hour later to say that yes, the doctor had given the go ahead, so out came the box of medical supplies. Judging by the number of other cabin crew who came to watch (Joe gave them a running commentary) I guess that this is not a common occurrence! Anyway, several forms were filled out, and I had to sign a consent letter, after which the drugs were mine! Well, not quite. The specific painkiller was a single 10mg tablet which dissolves under the tongue and lasts about six hours. I was to be given one then, at 12:50, just as we were clearing Myanmar coast and another just prior to landing, which would also see me good for the Manchester flight. There was also the option of being given a second dose (ie two pills instead of one) if required, which was at Joe’s discretion. Whatever the painkiller was, it worked very nicely. I still found sitting painful but it was tolerable, which meant that I could sit for meals, for example. This was particularly helpful since, when it came to lunch, we had turbulence between the courses, so everything was delayed and I ended up sitting for well over an hour. Joe, bless him, also came back with a second pill which I had at 14:30. You can see what I made of lunch after the gallery. I’ve had many, many good meals while flying with British Airways. Sadly, this was not one of them. I don’t know what went wrong, although having turbulence during the service/preparation time couldn’t have helped. Given how many good meals I’ve had, I’m just going to write this one off as an aberration. The service started at 13:30 as we crossed over the Bay of Bengal, which sounds far more romantic than it actually was. My starter, essentially a salad, was semi frozen, while the main course, tagliatelle with tomato sauce, was not very well done. This was served at 14:10 after a break for turbulence, as we flew over India, and showed signs of having been left in the oven for too long. I cast a wistful eye over the vegetarian options from the normal menu, which looked far more appetising. At least the cheese and biscuits were good, although I had to forgo my usual glass of port because of the painkillers (Joe was also very sure to check that I wasn’t planning on driving when I got to Manchester since they cause drowsiness). After lunch I had a quick wander, which was nice. One of the good things about these older aircraft is that they have decent-sized windows in the emergency exits, so when you are up and about, you get good views. In this case, it was fairly clear and cloudless, so I had plenty of opportunities to admire Myanmar (pre-lunch) and India (post-lunch). After that, I converted my seat to a bed and it was time for a snooze. You can see what happened on the rest of the flight after the gallery. Maybe it was the painkillers that made me sleepy, but my mid-afternoon nap saw me across all of India and Pakistan. I finally dragged myself up over Afghanistan at 16:45. I’d gone to sleep in daylight and woke up in darkness, the cabin crew having turned out lights and pulled down blinds at some point during my two hour nap (although it was still light outside, the entire flight taking place in daylight). I wandered up to the galley for a chat (where I discovered that this crew dislike this aircraft’s configuration as much as the crew did on the flight over) and to make myself some coffee, then had another wander before sitting down for maybe 20 minutes with my laptop. Wary of sitting down for too long, I had another wander around. Another of the perks I’ve found when flying Club World compared to World Traveller is that there always seem to be a supply of chocolate, biscuits and fruit in the galley. We had run out earlier in the flight, much to everyone’s consternation, but someone had found a secret stash, probably in a cupboard somewhere in the other galley, so passenger mutiny was averted. I sat down for a bit and then took a wander as we crossed over Caspian Sea. On this perambulation, I met a lady who’d been on a four-week holiday in Thailand. However, one week in, she’d slipped and badly broken her arm, resulting in surgery. As she said, at least this meant she had the bonus of flying home in Club World (her travel insurance upgraded her) but she admitted that it wasn’t much of a consolation compared to missing out on three weeks of her holiday. Nor, for that matter, for having pins in her arm. It also put the minor inconvenience of my bad back into perspective. On that sobering note, here’s another gallery. I interspersed wandering with either sitting for 20-30 minutes with my laptop, or lying flat on my back watching the new Bladerunner movie. The joys of a business class seat. However, I found the background music (noise?) really loud: I don’t know whether it was the relatively old age of the entertainment system, but I found that I really couldn’t make out the dialogue, so ended up watching it with subtitles on. I went for another wander as we crossed the Black Sea coast and made some more coffee as we crossed over into Europe, flying over Romania. By 22:00 we reached Budapest and twenty minutes after that, the lights came on. Dinner was served at 22:30, and thankfully was much better than lunch. I had cold (not frozen!) noodles and fruit to start, followed a different pasta in tomato sauce at 23:00 over Germany. This was more of a pasta bake, with small pasta tubes, and was much tastier than lunch. I also got my second dose of painkillers. After that, it was time for the final approach. I was trying to watch the end of Bladerunner 2049, but we were shown a series of arrival and charity videos, starting at 23:10 (still Bangkok time), which was annoying since they interrupted the movie every few minutes. It really should be my choice if I want to watch them. In all, the end of the movie was interrupted five times by announcements and videos. Please, just make one announcement and let us watch the movies in peace. I finally got to watch the end of the film as we crossed the coast of Holland, just before everything was switched off for our final decent into Heathrow. The seatbelt signs went on at 23:40 and we had a scheduled arrival time of midnight (six o’clock in the evening local time), which was twenty minutes early, but, as is often the case when the plane’s early, we went around a couple of times, landed at 00:10 (18:10 local time) and were at the gate at 00:20, which was pretty much on time. I’d spent 40 minutes sitting down, which, with the painkillers, wasn’t too bad and far better than take-off. You can see what I made of Heathrow after the gallery. I think experiences at Heathrow largely depend on your nationality. As a British passport holder, it’s a relatively benign experience. I breezed through flight connections, was the only person at passport control and my Club World boarding pass got through security in double-quick time via the fast track lane. And, for once, nothing got pulled out for a closer look. 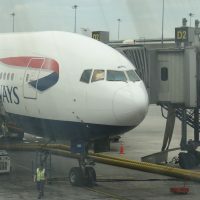 Within 25 minutes of the plane reaching the gate, I was into Terminal 5 departures, and that included taking the transit from the B Gates back to the main block. It was 18:45, and, with my flight not leaving until 20:40, I had time to kill, so I decided to seek out the lounge. British Airways has three lounges: North, South and the Quiet Lounge in the B Gates satellite. Having tried the Quiet Lounge on the way out, and having visited the North Lounge the last time I flew on to Manchester, I decided that it was about time I tried the South Lounge. However, it seemed that today was the day for not finding lounges, although my experience wasn’t quite as painful as my failure to find the Cathay Pacific lounge at the start of my journey. Terminal 5 has two main levels, and access to the North Lounge is via the top level. So, naturally, I reasoned, access to the South Lounge would also be from the top level. The South Lounge is part of a three-floor structure at the southern end of Terminal 5 (at least that bit is logical), but there’s no access from the top level of Terminal 5. Instead, having walked the length of Terminal 5, I then had to double back on myself, drop down to the lower level, walk back to the southern end of the terminal and then go up two floors to get to the lounge. Way to go whoever designed that one. Even when you get there, you have to know where you’re going since the Club World lounge is one of three at the southern end of the terminal (hint: turn right at the top of the stairs, not left). However, the good news is that it was worth it, since the South Lounge is very fine indeed. It feels larger than the North Lounge and although it could have been the time of day (or the fact it’s so hard to get into), it felt a lot quieter. It consists of a number of small areas, all interconnected, but each very distinct. There’s a central food area serving light meals and then off of that, there are lounge areas, coffee areas, computer areas and bars. There’s something for everyone and usually two or three of them if you keep looking. I found the end coffee lounge, which looked back over the top level concourse of Terminal 5 and settled in for what ended up being a longer stay than expected since the Manchester flight was almost immediately shown as delayed, with the gate only being displayed at 20:20. At least that was convenient since the gate, A22, was practically underneath the lounge. You can see how the flight went after the gallery. When I got to the gate, I was glad that I’d been able to camp out in the lounge, since, like most gates, there was nowhere near enough seating, particularly as the flight looked to be almost full. We boarded fairly quickly and for once I got to make full use of my Group One priority boarding, being pretty much the first person on. I was in my seat by 20:35, which, given my bad back, might not have been the best plan, but the second round of painkillers I’d had on the flight from Bangkok were still in full effect. Sitting down, while uncomfortable, wasn’t too bad, and, to put things in perspective once again, two people got on with crutches. I must confess to having been spoilt by all this long-haul flying. I’m really no fan of the narrow-bodied jets which make up the bulk of people’s flying experience. In this case, I was on an Airbus A319, the smallest of the three aircraft British Airways uses on the Manchester-Heathrow flights (the others being the A320 and A321). They all have a simple seat configuration, six seats per row, three on either side of the central aisle. That said, it’s not the narrow body I particular mind, it’s how close the seats are together, which, when I’m in economy, results in my knees being in the back of the seat in front. Even on a 35-minute flight, that’s pretty uncomfortable, which is why I’ll always pay for an exit row seat. However, up in Club World, there’s a bit more space, enough that my legs don’t hit the seat in front, but not enough that I can, for example, use my laptop. This is why I try, if I can, to get in the first row, where the presence of the bulkhead gives that little bit extra legroom and enough room to use my laptop. There’s also more space, width-wise, because while there are still three seats in the row, no-one sits in the middle one. Instead, it has a bench-like construct across it, turning it into a shared table for the seats either side. I was originally in Seat 2C, the aisle seat on the left, but when boarding was complete (at 20:50) neither Seat 1D (aisle) or Seat 1A (window) were taken, even though the flight was very close to full. After checking with the cabin crew, I moved up to Seat 1D, which meant that I had plenty of leg room. We pushed back at 20:55, with the captain predicting a 35-minute flight time. We played the obligatory taxi game for 20 minutes before taking off at 21:15. Food was served by 21:25 (starting with me at the front) and complete by 21:30, which was pretty impressive! The meal, mozzarella and tomato salad with cheesecake, was actually the nicest of the three I’d had that day! The seat belt sign came off at 21:25 and came back on at 21:35, so I didn’t get to use my laptop since I was eating all that time. We landed at 21:50, just as the captain had predicted, making it the first Manchester to London flight I’ve done in either direction where we’ve gone straight up and come straight back down again without any holding. Even better, we went straight to gate and were off the plane by 21:55 and… onto the tarmac. Because that’s what they do at Manchester Airport. And it was, of course, raining. I collected my bag and was out of the terminal by 22:10, surely the smoothest London to Manchester flight I’ve ever done. Well, that’s it for my Thailand adventures. I hope you enjoyed them. For those of you wondering about my back, the good news is that it’s much better, thanks. After about eight weeks of not being able to sit down for more than a few minutes at a time, first of all my back was slowly sorted out (mostly by twice-weekly visits to the chiropractor) and then the nerve pain slowly subsided. I spent the whole weekend of the Glasgow Coffee Festival on my feet in the middle of May, and had to take the sleeper there are back. By the time the Birmingham Coffee Festival came around in early June, I was still standing most of the time, but things had markedly improved. Two weeks later, I was off to Amsterdam for the World of Coffee 2018, and I could sit down for most of the train journey on Eurostar there and back. Today, I’m sitting in my hotel room In Tokyo, typing this, having flown from Manchester to Heathrow, then from Heathrow to Tokyo, a journey of 19 hours if you include the taxi to the airport and the train to my hotel in Tokyo. I spent the majority of that sitting down in no discomfort at all, so it’s safe to say I’ve made a pretty full recovery!